Biography of Mannerist Sculptor, Goldsmith. 3-D artists, see: Greatest Sculptors. Mannerist sculptor, goldsmith, technical writer and author, Benvenuto Cellini wrote a famous fast-paced autobiography, which arguably has given him a wider reputation than that justified by his works alone. Nevertheless, art historians now consider him to be one of the most important Renaissance sculptors, and his statue of Perseus with the head of Medusa is regarded as one of the masterpieces of 16th-century Florentine art. Cellini also wrote a number of technical books on goldsmithing, design and the art of sculpture. Cellini's career during the cinquecento may be divided into three basic periods: (1) 1500-40, during which time he worked mostly with precious metals; (2) 1540-45, when he worked in France for King Francis I at Fontainebleau; and (3) the remainder of his life in Florence, where he took up large-scale freestanding sculpture. Prone to violence and debauchery, as well as the creation of precious metalwork and other 3-D art, Cellini was probably lucky to live as long as he did. Benvenuto Cellini was the third child of the musician Giovanni Cellini. At the age of fifteen, contrary to the hopes of his father, he was apprenticed to the Florentine goldsmith Antonio di Sandro. The following year he fled to Siena to escape charges of riotous behaviour, where he continued his training under the goldsmith Fracastoro. From Siena he moved to Bologna, visited Pisa and returned twice to Florence, before leaving for Rome. He was nineteen years old but already attracting attention for his metalworking ability. Little is recorded of his early career in Rome, or the details of the goldsmiths or workshops where he practised his craft. We do know that he created a number of precious objects, including a silver casket and some silver candlesticks, after which he made a vase for the Bishop of Salamanca. This latter item brought him to the favourable attention of Pope Clement VII. Shortly afterwards, in 1527, during the violence accompanying the attack upon Rome by Charles III, Duke of Bourbon, Cellini's bravery proved of exceptional value to the Pope, who rewarded this service by smoothing things over with the Florentine legal authorities. This allowed Cellini to return to his native Florence, although he was soon on the move again - first to the court of the Duke of Mantua, then to Florence. From 1529 until 1537 he spent most of his time in Rome, where he became embroiled in various violent escapades, including two murders, being protected only by Papal intervention. During this period his main artistic output was a series of medallions - notably Leda and the Swan, created for the Gonfaloniere Gabbriello Cesarino; a medal featuring Heracles and the Nemean Lion, in gold repousse work; and another in chased gold featuring Atlas holding up the world - along with a range of jewellery, as well as dies for private medals and papal coinage. To learn how to judge Mannerist artists like the Italian sculptor Benvenuto Cellini, see: How to Appreciate Sculpture. For later works, please see: How to Appreciate Modern Sculpture. In Florence Cellini continued as a goldsmith but also took up large-scale sculpture in the round, becoming the rival of sculptor Baccio Bandinelli (1493-1560). 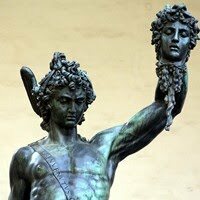 His masterpiece, made for Cosimo I de' Medici and one of the greatest examples of Florentine Mannerist sculpture, is the bronze statue Perseus with the head of Medusa (1545-54, Loggia dei Lanzi, Florence). The casting of this immortal statue reportedly caused Cellini the utmost trouble and anxiety, while its final completion and display was hailed with rapturous acclaim from all over Italy. Other notable although not memorable works included his two bronze portrait busts - Cosimo I (1545-8, Bargello, Florence) and Bindo Altoviti (1550, Gardner Museum, Boston) - along with several marble sculptures. The unveiling of Perseus (1554) marked the zenith of Cellini's career as an artist. Three years later he was sentenced to four years in jail for illegal physical practices, and his output thereafter was limited to his autobiography and various books on sculpture and the art of goldsmithery. He died unmarried in Florence at the age of 70, though survived by numerous children, and was buried with great honours.